With the help of Land Art – ephemerally, harmoniously arranged stagings in or with nature – mankind bows to the evolutionary masterpieces. Stefan Sakic is one of these humans. His atelier is the forest, his ingredients are all the wondrous forms which are shed by the woodland. Thereby he interrupts the circulation of becoming and fading, he is delighted in and gives us delight with the fascinating virtuosity while he rephrases it to a declaration of love to life. 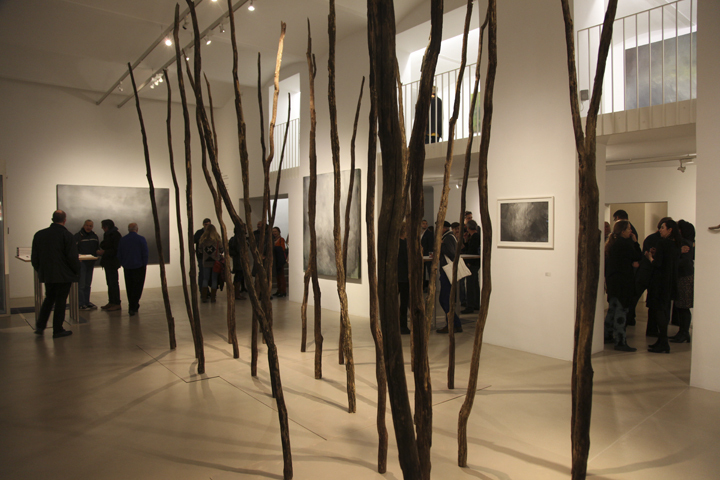 With this exhibition zs art tries to reliving the magnificence of nature in an urban gallery. The 5 meter high space opens up to Westbahnstraße with its ceiling-high windows. Stefan Sakic extends the cathedral architecture with a forest made out of dead trees, alike a columned hall. At the front sides Helmut Swoboda reveals the view of everlasting snow areas afar with his symbolically allusions of meditative Dachstein-paintings. Postcard idyll completely non-kitschy, intellectual puristically and at once unlimited multilayered. Contemporary painting in its ultimate mastership. Inspired by the dramaturgy of nature Helmut Swoboda formulates his abstract impressions in egg tempera and wax-emulsion on chalk primer in a mysteriously subtle way assuming an independent painting process without binding himself to a concrete reference. With „Naturverbunden“ ZS art celebrates a sensual perception of space, where painting and architecture of nature conglomerate with human art of construction.